A purplish-pink is the main color of the rug but it also has small yellow and teal flowers in its pattern. The rug is very soft and its overall pattern so lovely-like a painting! It looked so nice in our guest bedroom that I bought another one for our family room! My daughter loved it so I bought her one for the living room of her first home! We are very happy with the quality, look and feel of this rug-plus its reasonable price! This is a very vibrant rug that's easy to vacuum, does not shed, does not mat down, and has stood up to my high traffic living area. The background is ivory and a light cement grey color, with vibrant magenta and pinks, teal, marigold yellow, and a bit of olivey-tan. the edges are bound in ivory. 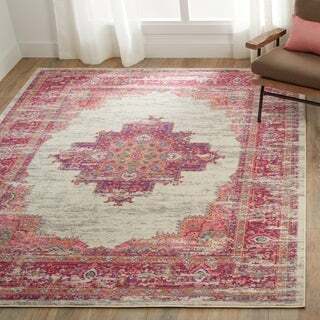 I shop alot on overstock for home items, and this rug is one of my favorite purchases. Guests assume I paid 4-5 times the amount for this 8 x 10 rug than I actually did. A very great rug for adding a pop of color. I fell in love with the detail, design and color pattern of this rug the minute I saw it! It's so beautifully made and what a great pattern to use to pair pink with ivory! I love it!! The pattern is attractive and the colors are whimsical and feminine and add a relaxing warmth to our living room and pair well with teal, fuschua, beige and cream furniture. The pile is soft but not massive. Happy with the rug and curious to see what it’s life span will be but for the price I’d consider even 3 years a bargain though I think it’ll last at least five. Would recommend this rug to anyone trying to add some whimsy and romance to your room. My rug was shipped quickly. The measurements were as advertised. The colors are an exact match to what my HP Envy laptop monitor displays. The rug does not look 'distressed', faded or worn and that is fine by me. The quality is excellent; there was no shedding when I unrolled the rug from its packing.or when I've walked on it. This is a beautiful rug! It’s a little more teal than navy. The picture is a little deceiving but it is still gorgeous!It works perfect in our room and I would highly recommend. it works perfect in our room and I would highly recommend. Very pretty rug! The pink and teal pattern really pops against the light gray background. The rug is on the thin side so if you wanted something softer you may want to get a pad for underneath. I am so in love with this gorgeous rug! It's perfect. Great colors in this rug too. Gorgeous rug, no question about that. But no rubber backing. Most or many rugs have built on rubber backing, but not this one. Awful. Slipping all over the place. I would rather not get an additional non-slip mat to place under it, so as to keep the rug on the low side (I need it to fit under a door). I am returning this rug. Love love love this rug! Awesome colors and great quality for price! Would recommend this rug to everyone!!! This rug is even more vibrant than the pictures. I paired it with a rug pad in my living room and now have a soft and beautiful area to sprawl out. The size is perfect for my cottage living room. Looks even better in person. I love the color and design. Rug is soft and great quality. It was worth the extra money for the thick non-slip pad. Beautiful and great quality rug! Love it in my living area. Love my New Area rug! It is Beautiful and the Brilliant colors are amazing. Made very well, it is worth your money!! Very soft and comfortable, colors are lovely and fits well with my decor. Overall a beautiful area rug. It's a Bohemian pattern with the right amount of color pop without being gaudy or overwhelming.I bought the 8x10 and couldn't be happier with the texture and construction. It's not plush or super thick but has just enough softness for comfort. I have received many compliments. This rug will last for many many years! The rug arrived quickly and was well packaged. The colors are very bright, especially the pink tones, so if you are looking for nearly neon pink than you would appreciate the intense brightness. From far away the rug looks nice but standing on or near it you can see that the rug looks inexpensive and not of good quality. This rug is very thin (which is actually something I need for the space I intended the rug for). It is not soft, and will not lie flat but I suppose that could change over time. Overall, the rug will not work for me so I will be returning it. The colors are vibrant and perfect for my granddaughters bedroom! The short nap is easy to keep clean and has held up well since purchase. We paired it with off white furniture, gray walls, and accent art with golds and touches of the pink and some taupe to keep things neutral. More than a rug, it is a beautiful decor piece when you need that bright punch of color! The colors in this rug are very vibrant and pretty, just what we were expecting from the picture. The material is soft on our feet but thin. I ordered a thick rug pad to go underneath but I don’t feel it help all that much. Overall happy with the quality of the rug though for this price. Bought this area rug for my front entryway. I was concerned about putting it in such a high traffic area. I've had it here for several months now and it still looks brand new! The color is true to picture as described also. Love this area rug!